"Weather" you are a full-time home educator, after-school educator or just a mom looking for enrichment, the wind is your friend! You know that I adore any method that helps a child learn, grow and find contentment in their own environment. Many time few experiences will beat the joy of learning found just outside your own backdoor. It is for this reason that studying nature has become an essential portion of our schooling at home and at cooperative. There is an amazing connection to our Creator while observing all the blessings He has set before our eyes daily. Simple joys. 1. Construct a Weather vane and observe how the direction of the wind makes it move. Proverbs 3:6 "In all your ways acknowledge Him, And He shall direct your paths." 2. Give your students packages of wildflower seed and allow them to use the wind to spread them on a windy day. It will be fun for you and your students to reap the rewards of those flowers at a later date. Psalm 107:37 "And sow fields and plant vineyards, That they may yield a fruitful harvest." 4. Enjoy the outdoors on a wind swept day. Use a pinwheel or wind streamers to observe the wind. Bubble blowing and wind chimes are also lots of fun. 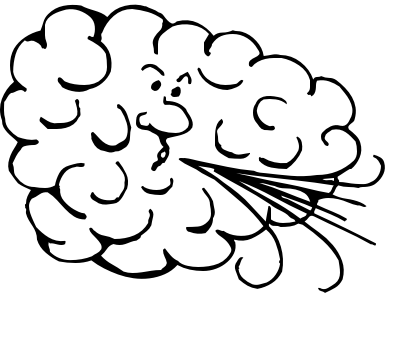 Have your student take turns using adjectives to describe the wind on that day. Psalm 18:10 "And He rode upon a cherub, and flew; He flew upon the wings of the wind." 5. Build little sailboats from sticks and make sails to use on a windy day. 6. Have cotton ball races across the table. Using straws to propel the cotton across the table to demonstrate the force of the wind. 7. Read these living books to discover more about the wind: Miss Rumphius, The Wind in the Willows, Feel the Wind, Curious George Flies a Kite, Gilberto and the Wind - Have your students act out their favorite parts of the story. 9. Wind direction and strength, how hard or soft is it blowing and how can you observe the direction of the wind. 10. Have your students observe the wind in motion. Have them use different words to describe how the wind looks and feels. Take a basket with different objects from the house, outdoors with you (paper cup, rock, pencil, cotton, paper, etc.) What objects move because of the force of the wind? My Friend the Wind Notebooking pages - FREE printables. Hoping you, my dear readers, will find some time for reveling in God's great creation with your kids today. I could see that your ways are really effective in teaching your child at home. I might also try this out! Giving your child Children Books is helpful too.